New Zealand is a great place to ride off road, we have plenty of open space and a mindset that some motorcycling in the back-country is a legitimate recreational activity. That said, thirty years ago the situation was even better and if a man had a mind to go somewhere on two wheels, pretty well anywhere, there was no reason why he shouldn't give it a go. 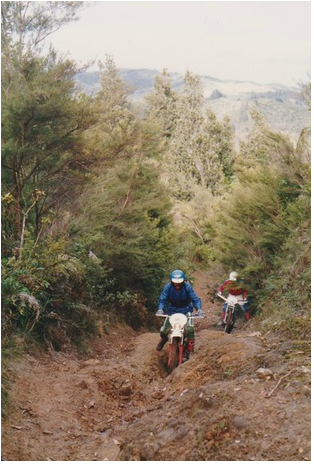 So it was in the early 1980s when three good trail riding friends decided to undertake the toughest one day trail ride we had attempted, a dual crossing of the rugged Coromandel Ranges. While the Coromandel Ranges are not especially high, they are especially steep and broken and clothed in heavy rainforest. Under the tall trees is a tangle of creepers, vines and undergrowth. There are however a few foot tracks. Most of these are the remnants of pioneer trails constructed in the 1800s to exploit timber and minerals. Transport in the ranges was on foot or pack mules. Timber was extracted not by roads (there were none in the modern sense) but by felling trees into valley systems, damming the rivers and letting the whole lot go in a giant wave, so large the logs were carried all the way to the coast.